Skyscript.co.uk :: View topic - Why Can't I See A Breakup? Why Can't I See A Breakup? Posted: Fri Aug 28, 2009 10:57 pm Post subject: Why Can't I See A Breakup? Have I gone retarded? Okay, it was a hit the ground running before coffee day, and I just got round to doing the chart, but I'm still not seeing him leaving her. Seeing that he got the new job (her - Mars in Cancer, him - Venus in Leo, job - Mercury in Libra in 10), but Mercury is going to regtrograde in nine days so not so sure that's going to work out. Meanwhile, he's Venus in Leo, she's Mars in Cancer, and Mercury seems to be tying them together, him by sextile, her by square, though the square is without reception, and not too comfortable. The upcoming Moon aspect is a square to Saturn, but Moon receives Saturn by both term and face, making it a perfect reception. They're both in the eighth house, which may be relationship worries, but a friend of theirs committed suicide quite recently, and I know they're both really shaken up over it, especially him. She's convinced he's breaking up with her. And Mars is in detriment aspecting a planet in the sign of its fall. Okay - maybe it's starting to come together here. A little. I still feel like I'm missing something huge in this chart, though. Trust the client, I've dealt with her before, but I'm still a bit - flummoxed. Olivia - was the question whether or not they would break up? Also, Mercury is the querent's job, Jupiter is the quiested's. Thank you Tanit, and yes that was the question - she asked if there was going to be a break-up. More specifically, if he was going to leave her. I think I need more coffee. Duh on mistaking his job for hers. and thank you for pointing it out - strangely that same sort of thing came up about three months ago when she asked if he was going to leave her then - heavy emphasis on her career, but not so much on his. Posted: Fri Aug 28, 2009 11:57 pm Post subject: Re: Why Can't I See A Breakup? Have I gone retarded? What am I missing here? There's Saturn sitting on the MC! It just might be answering your question! (No, not that you've gone retarded, of course but it could be a warning for you as their/her Astrologer). Yes, is the question "Is he breaking up with me"? Does she think he might leave or did he say that he was actually leaving her? EDITED: we were writing simultaneously- I have just found your answer to tanit's question! It's complicated and you're right - Saturn on the MC. Ouch ouch ouch. Remind me that lack of caffeine and flu medicine do not a good astrologer make. He hasn't said he's leaving her (at least not that I know of, but I'm going to ask again), but he's been a little distant since the friend's death, and she's been freaking out - he had a job offer but it wasn't that far away - 45 minutes travel or so. And both times, her career has figured prominently, not his, and me - I keep feeling like I'm missing something. I tried cards and if anything from that, it looked like she was more likely to leave him. I may just pass this one on to somebody else. I really feel like I'm missing the big picture here. Referred out - glad I have someone who can do that for me. I need the money, but not enough to screw up a chart on a client. I shall keep you posted as to what it turns out to be, though. I'm sure you did the best thing! The degree of the rising sign says this is already decided - a late degree, and warns against judgment also. IMO, Venus is in the 9th (within 5 degrees), his 3rd of short-distance travel, but he�s in a fixed sign, which doesn�t usually mean �movement.� He is peregrine himself, and also peregrine to Mars, so he�s just really lost in this relationship. There is no future aspect or mutual reception between them to hold them together very well, though Mars has slight dignity by face to Venus. Both sigs are weak, and Venus in particular is conjunct the dragon's tail. It doesn't seem like there's much going for them in this relationship. I think we all know some relationships end with a whimper and not a big bang. I think what�s confusing is that he doesn't show much action in the chart, being peregrine and in a cadent house. I usually get charts asking whether people will get together or stay together vs. people leaving. This looks like a "we aren't staying together" chart, but the way it was worded "is he leaving me?" vs. "are we staying together?" changes things a bit. No action likely just means he�s not leaving, even though they are both struggling in the relationship right now. This is especially true with a late degree, because they haven't broken up yet, so they probably won't any time soon. Saturn may represent the commute (ruler of the 3rd and dispositor of Jupiter). There is that applying square from the Moon to Saturn, and also mutual bad reception between Venus and Saturn, so the commute is likely to be a problem, especially for him, though both Venus and Mars hate Saturn (both in Saturn�s detriment). I hope you let us know what the other astrologer sees also. I'll definitely keep you posted. And somebody remind me that Saturn on the MC is always my Waterloo - because it is. You're right - he's closer to 9 than 8, and conjunct the SN - not a good sign - but again - if there's a break-up there, I can't see it. It's more waiting for Godot. Wish I had the last one when this issue first came up, but Janus has crashed on me too many times. I managed to salvage a bunch of charts, but I didn't get that one, unfortunately. Newer computer next week. YES! Though that doesn't help my poor client. And a big chunk of the puzzle falls into place. Boyfriend has bipolar disorder. What I did not know, but what she told the other astrologer was that since their friend's suicide, he's gone off his medication for it, so his mood swings have been all over the place. Yes,especially as 7th house is conjunct Caput Algol- the boyfriend and the Astrologer both lost their head ?? ouch, so sorry to her that. From my own personal experience,I can confirm that - while healthy people usually seek for help in very stressful situations- bipolar people and those suffering from similar disorders- often stop accepting it which more often than not, includes drug manipulation or giving up on medications ; very stressful situations then become even worse for everyone. (By personal experience, i mean "inside my very close family). It is actually quite interesting that I've been dealing with a similar problem lately. I did a chart for my own question after spending months and months trying to solve a problem with some of my family members (it was a mutual problem and a huge one) but it seemed as though they were only making the things worse (which was a pretty shocking discovery given that they were losing their minds over the same situation and were rather desperate to solve it). When some of the things (as well as me) simply crushed- I asked a horary trying to get a better insight into the situation and hoping to find something I could use to turn the things for the better as what had been happening was obviously a pattern, and patterns cause the things to repeat themselves. To say the least-the chart left me just as puzzled .I didn't understand the situation, i didn't understand the chart. Unfortunately, seeing a relevant planet besieged between Mars and Saturn was only supporting my "from bad to worse pattern" idea. When I accidentally mentioned some of these things to one of the psychiatrist I know (luckily, I know many shrinks - he jumped and said that some psychosis can cause people to act that way. They don't act strangely, they don't look like "mad" people- they make mistakes that can even put other people in danger without even noticing it, even to their dearest ones or to themselves. Their mood-swings can be quite fascinating as well, needles to add. That's why the chart did not look very promising though it was showing some very obvious signs of a good will to solve the problems and of a positive connection between the people who were involved. ("Why would someone do that if he/she does not want to harm me!?" Well, apparently- there is a very logical explanation. ) Naturally, as always in life- such situations are usually multi layered. If only one person is suffering from a disorder- why are others acting strangely and bringing just as harmful decisions. The psychiatrist I spoke to gave me a very clear answer (and example)- a financial expert suffering from a certain psychosis or psychotic behaviour, will act like most other patients who share the same diagnosis and that will often and most likely, include- spending beyond his/her and their family's means! But, because he/she is a financial expert- other will blindly follow him/her expecting that he/she knows better. Often until it is too late to repair the damage. Also- suggesting a person to take a pain-killer is a far less delicate thing to do than discussing his/her behaviour him/her (which is only a symptom). 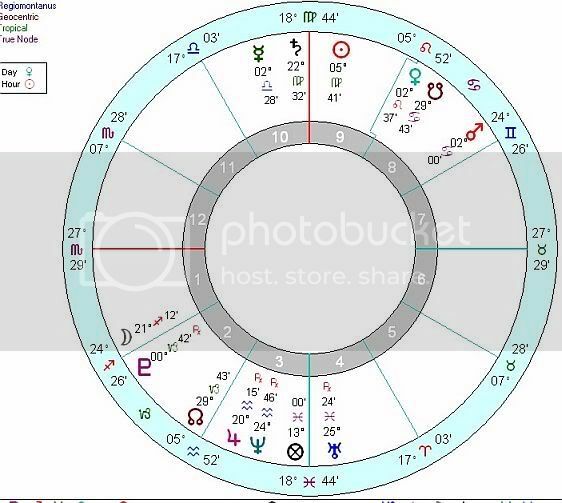 I believe that it is good that you have forwarded this chart to another astrologer but I also hope that he/she will have a very clear insight into the situation. Those things can be very tricky and, obviously- very confusing even without Horary questions. WE don't expect that a disorder could affect someone's behaviour that way- we expect the people who are sick , be it a broken leg or psychosis, to keep their emotional construction. Unfortunately- in some cases, the symptoms are not "pain in the abdomen" or "dizziness"- love and carrying people can sometimes act as your enemies. That's why living with those people is hard and why often- things can make so little sense. I really do hope your Querent's boyfriend will start taking medications again soon and I wish them all the best. I do sympathise with them. To your colleague astrologer too, of course- it's a very, very tricky situation. I was reading this thread earlier, having found it through Yuzuru's list of charts with answers. It was interesting to track the progress and the medication issue coming to light. I couldn't see a break-up in the chart either, and I must admit I'm interested to know, and would like to gently and respectfully enquire, what became of the querent and her original concern about being left?